Little Hedgehog celebrates another happy Christmas with his animal buddies in this latest entry in a popular series. 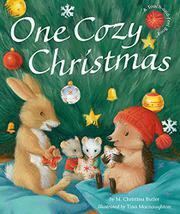 This time the group of friends is spending several days leading up to Christmas at Little Hedgehog’s comfortable home. They decorate their Christmas tree together in harmonious fashion on the first night, but after their second night sleeping on the floor together, everyone is in a cranky mood. Someone was snoring, someone else couldn’t sleep, a third someone stole cookies off the Christmas tree, and worst of all, Little Hedgehog has lost his special red hat. On Christmas morning, Little Hedgehog receives a new red hat knitted by Badger, and the old red hat is discovered hidden in the Christmas tree with a sleeping squirrel nestled inside. The squirrel joins in the Christmas morning festivities as the animals play with their Christmas toys. As in previous entries in the series, Little Hedgehog’s hat has a flocked, velvety surface that adds an additional layer of interest to the appealing, large-format illustrations. The animals are cute and cuddly as always, especially Little Hedgehog, and their outdoor activities, including skating and sledding, complement the warm, comfortable indoor scenes of the burrow decorated for the holiday.